Biochip-based diagnostic kit «OM-Biochip (PSA)» for quantitative determination of PSA, total and free forms, in blood serum by immunofluorescent method. 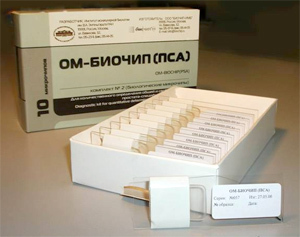 Biochip-based assay of two forms of PSA is carried out in «one patient - one biochip» format. Sensitivity of detection is 0.3 ng/ml for PSA, total form, and 0.3 ng/ml for PSA, free form. Variation coefficient (CV) for the measurements within one batch of biochips is not higher than 10%. Biochip contains gel elements with immobilized monoclonal antibodies against PSAtotal and PSAfree (4 identical elements in a row). Immobilized antibodies against PSAtotal recognize both PSA in a free form and PSA in a complex with α1-antichymotrypsin. Immobilized antibodies against PSAfree bind PSA in a free form only. Fluorescently labeled monoclonal antibodies which are able to bind both free PSA and PSA in a complex with anti-chymotrypsin are used as developing antibodies. The intensity of fluorescence signals from biochip gel elements containing antibodies is proportional to the concentration of PSA in a sample. 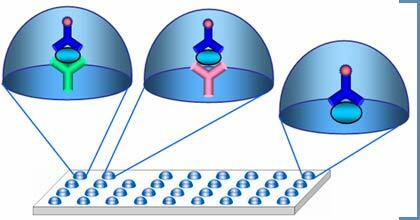 In addition to the elements with immobilized antibodies biochip contains the elements with immobilized antigen (PSA) in different concentrations. During the assay, immobilized PSA interacts with developing antibodies and the intensity of fluorescent signals from gel elements with PSA is proportional to the concentration of immobilized PSA. 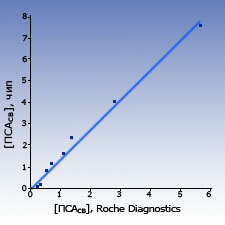 This dependence, which is obtained on each biochip, is used as an individual calibration curve for PSA quantitation (internal calibration curve). Three-dimensional computer emulation of the fluorescence image. A solution of fluorescently-labeled developing antibodies (10 µl) is added to a blood serum sample (50 µl). The mixture is applied to the biochip and the biochip is incubated at room temperature or at 37oC. During incubation, PSA from the blood serum interacts with biochip-immobilized antibodies and fluorescently-labeled developing antibodies (sandwich immunoassay). 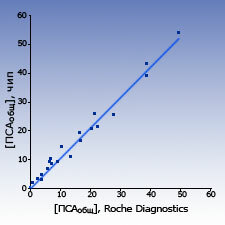 At the same time fluorescently-labeled antibodies interact with biochip-immobilized PSA to form an internal calibration curve. After incubation and washing, fluorescence image of the biochip is obtained using a Fluorescent Biochip Analyzer. 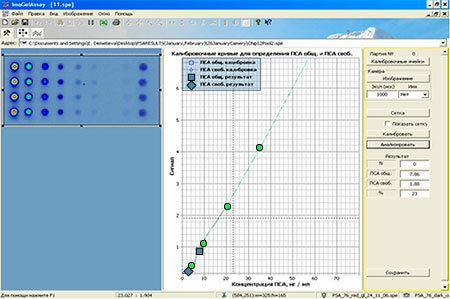 Concentration of PSA total and PSA free in a blood serum sample is automatically calculated by the «ImaGelAssay» computer software (developed in EIMB RAS) using the internal calibration curve. The results of measurements of PSAtotal and PSAfree concentration in blood sera samples of healthy donors and patients obtained with biochips were close to the results obtained by the standard ELISA systems. Prostate-specific antigen (PSA) — serological marker of prostate cancer, one of the most widespread type of cancer in men. PSA is a highly specific tumor marker. Determination of concentration of two forms of PSA and their ratio in a blood serum of a patient allows carrying out differential diagnosing of malignant and benign tumors of prostate. Group of risk — men aged 50 and above.